Musings 'n scribblings of a philanthrope .. : What NASA and Kepler Space Telescope will tell us on 14 Dec 2017 ?? What NASA and Kepler Space Telescope will tell us on 14 Dec 2017 ?? 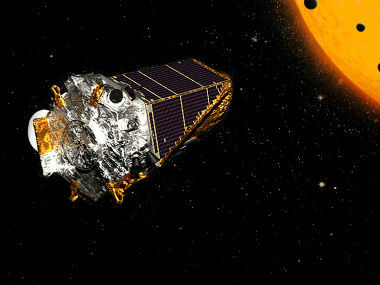 NASA'a important mission to analyse planets revolving around the solar system, Kepler Space Telescope, was launched in 2009 and after a three year period its mission was extended to study planets revolving other stars outside our solar system, exoplanets. Till date, 8 years after its launch, Kepler Space Telescope has studied more than 150,000 stars and on Thursday Dec14, 2017 NASA is bound to make a very startling revelation / discovery. Google Machine Learning AI algorithm has played a major role in this discovery as claimed by NASA. We will get to know the finer details later. Is it discovery of evidence of life on an exoplanet outside our solar system or presence of a civilization or discovery of life on many exoplanets, we have to patiently wait till Thursday. The whole world, especially the spiritual world is eagerly awaiting the discovery as the presence of dead ancestors or humans of another civilization on an exoplanet can greatly damage the roots of spirituality on earth namely through concepts like existence of heaven, hell, rebirth etc. can be put to question. Till Thursday, the suspense continues ..
Click here for Guardian details on Kepler 438A, the exoplanet 475 light years away in th constellation Lyra, said to be 12% more thaan the size of earth, receiving 40% more energy from the star with an orbital period of 35 days, has a 70% chance of being rocky..